Defense Minister Takeshi Iwaya indicated Friday that the return of land occupied by a key U.S. military base in Okinawa will likely not be realized by fiscal 2022, despite the start the same day of full-fledged land reclamation work to build its replacement facility. “It seems difficult to achieve the goal” as the relocation plan for U.S. Marine Corps Air Station Futenma “has gone through various transitions,” including the Okinawa Prefectural Government’s withdrawal of its permission for land reclamation necessary for the base transfer, Iwaya told reporters. In April 2013, Tokyo and Washington agreed on the return of the Futenma site, which is located in a crowded residential area of Ginowan, in “fiscal 2022 or later.” The two countries plan to move the airstrip to the Henoko coastal district of Nago in the prefecture. “We will proceed with construction work to realize the entire return of Air Station Futenma as soon as possible,” the minister added. Earlier in the day, the central government began pouring soil and sand at the planned site of the Futenma replacement facility in Henoko. 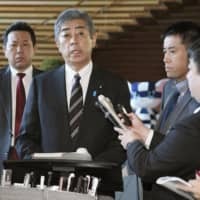 Chief Cabinet Secretary Yoshihide Suga maintained the government’s position that the current relocation plan is the “only solution” for removing the dangers posed by the Futenma base, which is situated close to schools and homes, without undermining the deterrence of the Japan-U.S. security alliance. “We will persistently try to gain the understanding and cooperation of local people by explaining the government’s efforts to reduce their burdens” from hosting the U.S. military presence, the top government spokesman said. Opposition parties strongly criticized the government move, which was conducted despite local opposition. “We can’t help but feel anger. 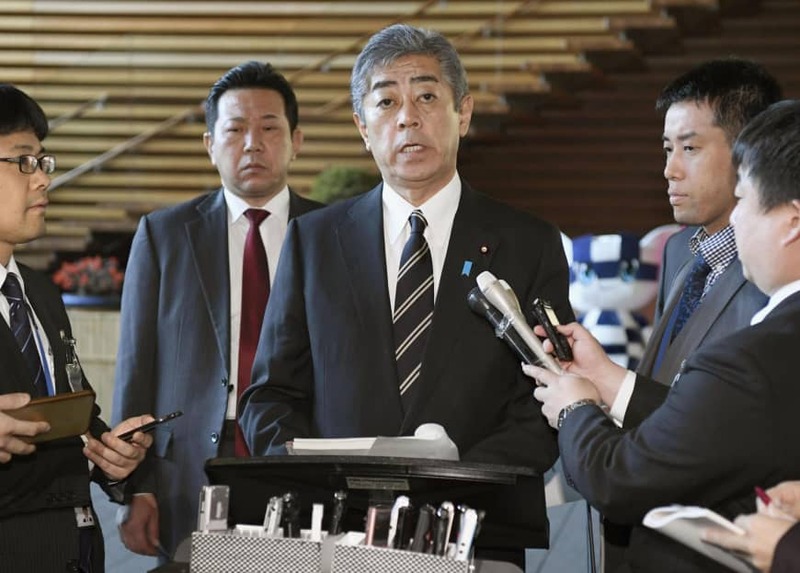 We will strongly urge the government to immediately stop pouring soil and sand and resume a dialogue with the Okinawa Prefectural Government,” said Tetsuro Fukuyama, the secretary-general of the leading opposition Constitutional Democratic Party of Japan. “The Abe administration doesn’t have any sympathy for Okinawa or humility to (acknowledge) the people’s will” given that Okinawa Gov. Denny Tamaki was elected on a platform of opposing the relocation plan in the election in September, Fukuyama told reporters at the Diet. “Pouring soil and sand is discrimination against Okinawa. We condemn (the government) in the strongest terms and oppose” the move, said Kazuhiro Haraguchi, Diet affairs chief of the opposition Democratic Party for the People.